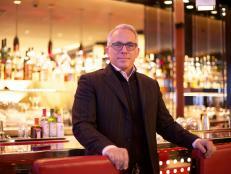 Geoffrey Zakarian hosted the Greenmarket Brunch at the New York City Wine & Food Festival this past Saturday. 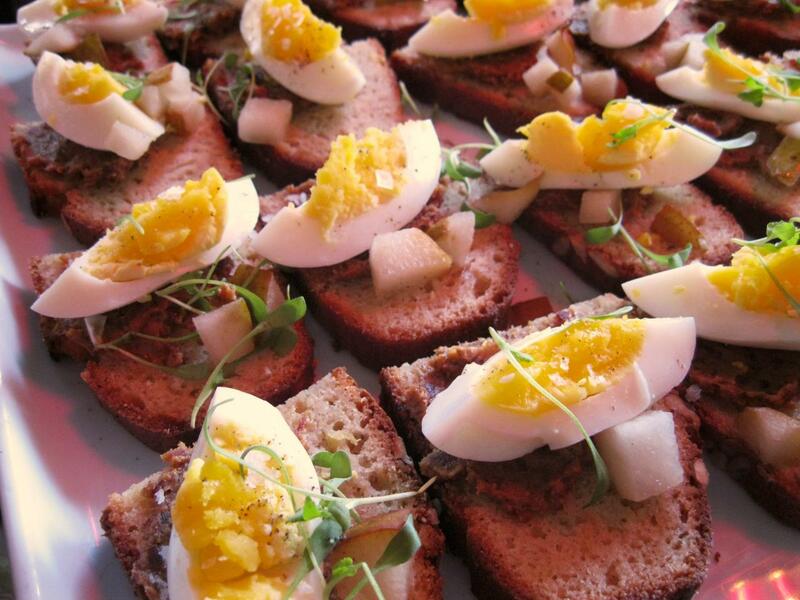 See some of the best bites from the event. Anyone who heads to Union Square's Greenmarket three or more times per week, like I do, will often see chefs geared up with carts and bins, buying some of the best produce from the farmers who've set up stands in the square. Without tracking down all of the restaurants that frequent the market, one's left imagining what dishes those items might end up being turned into. 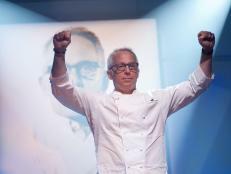 But at the New York City Wine & Food Festival's Greenmarket Brunch hosted by Chopped's own Geoffrey Zakarian, farm-to-table enthusiasts can experience all of the fruits of the chefs' labors. It's a unique collaboration, yielding some flavorful bites. 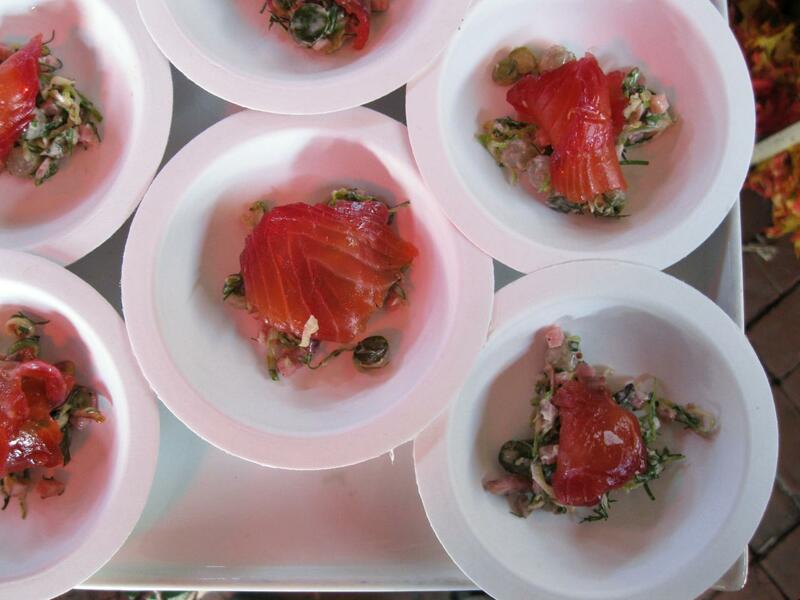 "You have eight amazing farms and eight amazing chefs," said Geoffrey about the eighth season of the event held in The Standard High Line Hotel's Biergarten, a rustic, open-air terrace underneath the High Line Park. 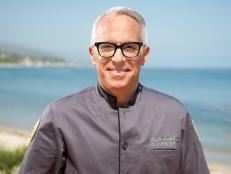 He explained that each chef had the opportunity to pick the produce from the farms to feature in his or her dish. 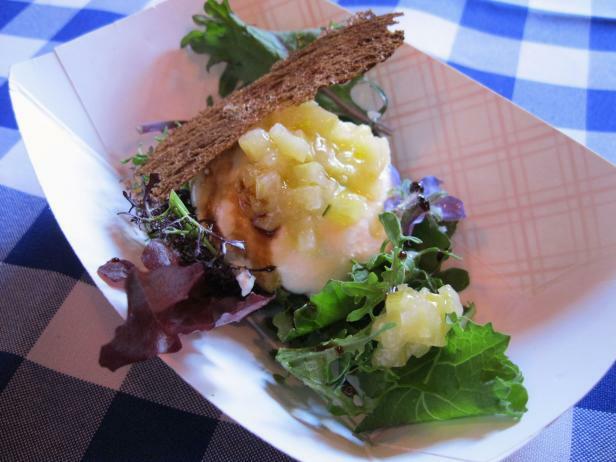 "It really is very special," he said of the pairings, also pointing out the smaller size of the event, which offers festivalgoers the chance to get to know the chefs and farmers, who are also on hand. 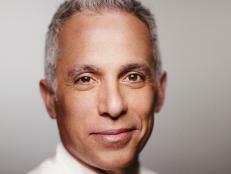 The Iron Chef also revealed he cooks breakfast for his family every weekday: "I have three kids. 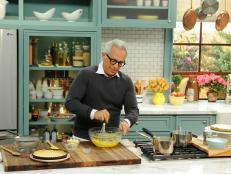 We start at 6 a.m. We gorge ourselves." But on the weekend it's a different story, as Geoffrey likes to head out to some of his favorite restaurants for brunch. Although he loves to try new restaurants, Geoffrey admitted, "I'm a creature of habit." He said he often ends up at some of his favorite spots in the city, like Via Quadronno, Balthazar, Lafayette and Barbuto (where he was headed after the event). Geoffrey's restaurant the Lamb's Club served up a refreshing gravlax, cured with beets from Mountain Sweet Berry Farm, over a crunchy slaw of Brussels sprouts and heirloom snow peas. 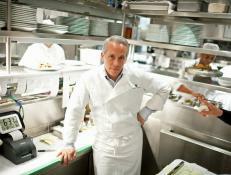 His restaurant The National served four dishes, the highlight of which was an earthy rye griddle cake topped with a pork confit, poached pear (from Migliorelli Farm), chestnut and a perfect hard-boiled egg quarter. The restaurant Perry St, helmed by Jean-Georges Vongerichten and his son Cedric Vongerichten, presented a dish that stood out from among the more usual brunch offerings: a housemade Burrata cheese topped with lemon jam and a pumpernickel toast, served over mesclun salad from Windfall Farm. 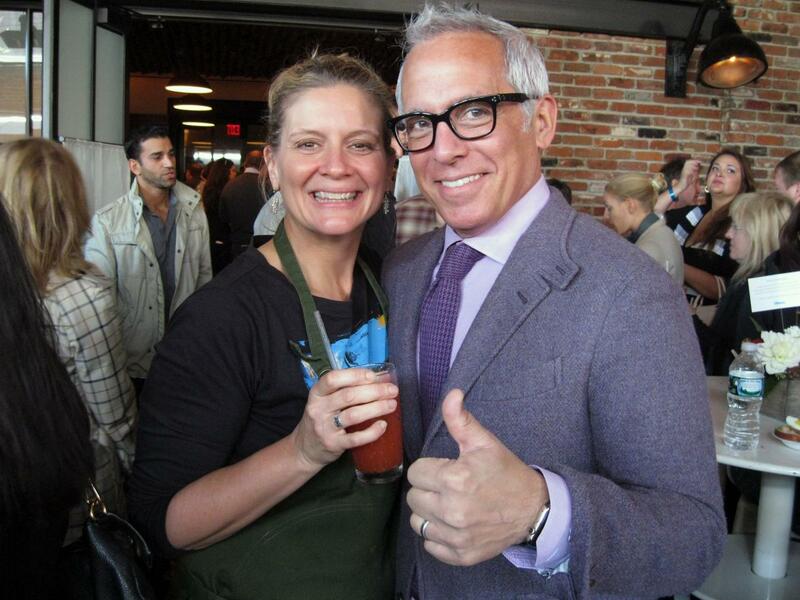 Chopped judge, co-host of American Diner Revival and first-time cookbook author Amanda Freitag was also serving at the event. 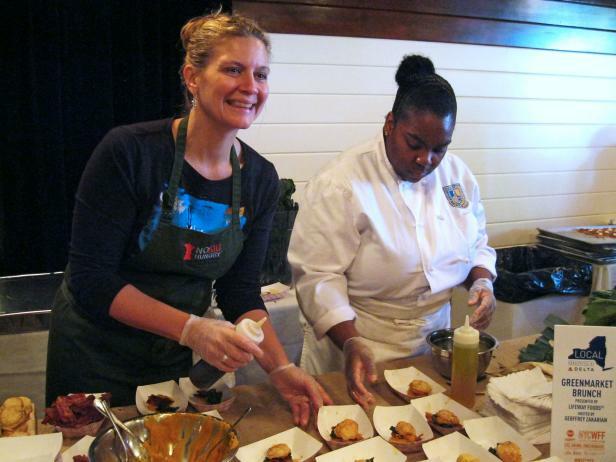 Her buttermilk biscuit with crispy bacon and pureed honey nut squash and kale (both from S&SO Produce Farms) was, as expected, a delight and comfort, especially on a particularly brisk day in the city. 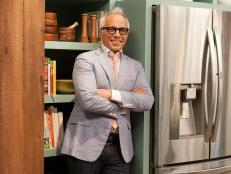 Keep coming back to FN Dish all weekend long for more insider coverage of the New York City Wine & Food Festival. 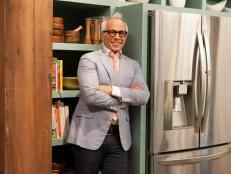 FN Dish asked Chopped judge and Iron Chef Geoffrey Zakarian about his strategies for shopping farmers markets and hosting a weekend brunch. 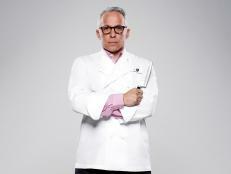 Newly crowned Iron Chef Geoffrey Zakarian chats about the intense Next Iron Chef experience. Take your Bolognese to the next level of craveworthy comfort with the help of Geoffrey's expert tips, and get his five-star recipe.